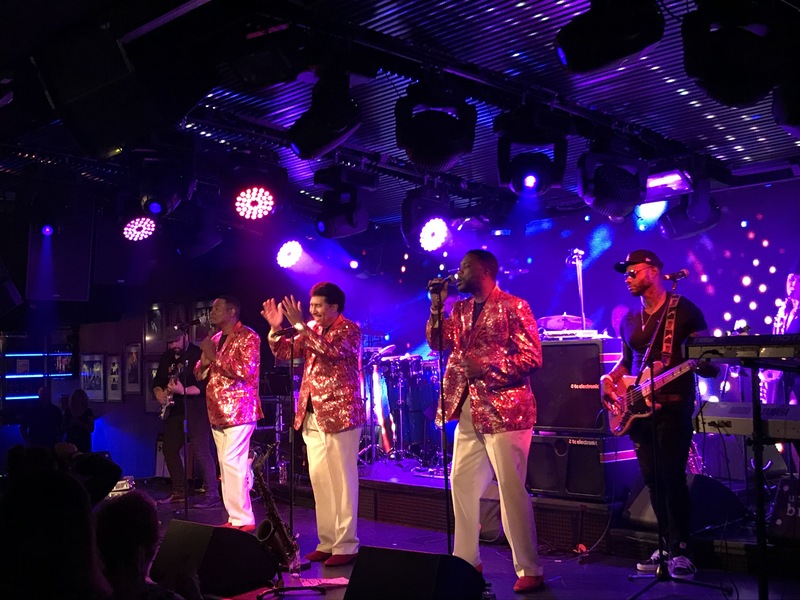 Last week saw the return of soul icons Chairmen of the Board to London, and we were there to see the latest incarnation of the group perform. The Chairmen of the Board, featuring Ken Knox, performing at Under The Bridge. It’s intriguing that on the other side of the Atlantic the Chairmen of the Board are “beach music” icons, a sub-genre of R&B popular in the Carolinas, while over in the UK the group are more associated with Northern Soul, a sub-genre of soul based on the pounding Motown beat. The fact they are big on the Northern Soul scene is perhaps no surprise, given that their success was built on Motown’s famed songwriters Holland-Dozier-Holland leaving the Detroit-based label. In fact, if it wasn’t for Holland-Dozier-Holland leaving Motown, we may never have had the pleasure of enjoying the Chairmen of the Board. H-D-H left Motown and started their own labels, Hot Wax and Invictus Records, the latter of which the Chairmen of the Board were signed to. The group was originally formed by General Johnson, an incredibly talented and distinctive vocalist who was equally talented with his songwriting pen. He wrote hit songs from Chairmen of the Board and as well as other Invictus artists, perhaps most notably the anti-Vietnam War classic “Bring the Boys Home” by Freda Payne). He was joined by Danny Woods and Harrison Kennedy, and together the trio became one of the most recognisable outfits in soul music. The group itself is a bit of an intrigue in that it no longer features any original members: Danny Woods and General Johnson are deceased, and Harrison Kennedy left the group in the seventies when the group first split up. When the group reunited later in the seventies, Ken Knox replaced Harrison, and in an incredible show of loyalty, the Johnson, Woods and Knox line-up remained together for nearly four decades. Once Johnson passed, Woods decided to leave the group, leaving Knox as the group’s leader. And, as group leader, Knox has brought the current incarnation of Chairmen of the Board on a UK tour, taking in dates across the country, starting in London last week at the excellent Under The Bridge in London. The group today consists of Knox, on vocals and saxaphone, along with singers Brandon Stevens and Thomas Hunter. As Knox himself said during the show, they love playing in the UK. The group was backed by 3 musicians who regularly tour with the Chairmen of the Board. They were joined with the drummer, percussionist and horn section from the UK-based Northern Soul group The Signatures. The group is the Chairmen of the Board’s opening act for their 2018 UK tour, and the full ten-piece band performed a 75 minute set combining Northern Soul classics, from Franki Valli’s ‘The Night’ to The Carstairs ‘It Really Hurt Me Girl’, with original material. The group were good, well drilled and it was clear that they love their Northern Soul. Unlike with other support acts I’ve seen, the band had the crowd dancing early on in the night. Half of us were gently bobbing along, while the other half engaged in vigorous Northern Soul dancing. Impressed by the fluidity of the Northern Soul dancers, I did spend five minutes watching a YouTube video explaining how to Northern Soul dance – it’s more difficult than it looks, and it’s not helped by the pace at which you end up hurtling around the dancefloor. A 20 minute break ensued, allowing our Northern Soul dancers to grab a refreshing pint or two, before the Chairmen of the Board took to the stage. Given that they’d only had a day or so to rehearse with the Signatures, the blending of the various band members was impressive, giving the Chairmen of the Board a dynamic and brassy backing from which they added their sweet harmonies. After a quick overture Knox, Woods and Johnson appeared, decked out in matching bright white trousers, snazzy shoes, and sparkling pink and silver jackets. From the moment they took to the microphones, it was clear that this vocal unit is seriously impressive. Their harmonies were smooth from the start. Each singer possesses a fine voice, and, unlike in other R&B groups, each member was able to sing a fine lead vocal when required. Thomas Hunter has a fine falsetto, while Knox was very impressive on his leads (he also plays a mean saxophone solo), but it was Brandon Stevens who really impressed on his lead vocals. His powerful, churchy voice was a real delight to hear. It’s a hard task to replace the great General Johnson as lead singer as his distinctive sound can never be replicated. 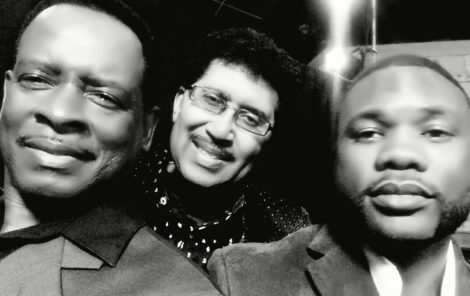 But, then, these new Chairmen of the Board weren’t trying to replicate his sound, they instead gave these classic soul songs their own unique flavour while retaining the essence of the originals. Knox is the bandleader now, and this is now his group. But it was once led by General Johnson, and Knox paid respect to the group’s former lead singer throughout the performance, at one point calling him his best friend. As if to justify his use of the Chairmen of the Board name, Knox recounted when an ailing Johnson asked Knox to carry on the legacy of the group just before he died in 2010. Since then, Knox has done just that: for the past 8 years Knox has kept the Chairmen of the Board legacy alive through live performances, and some new recordings, including last year’s excellent Words Left Unsaid album. Playing to the audience, the group opened with a blistering version of ‘Working on a Building of Love’, a Northern Soul favourite. Indeed, the set was primarily full of classic Chairmen of the Board soul hits, which was a little surprising given their prominence on the Beach Music scene in America (their ‘Carolina Girls’ song paid tribute to the Carolina R&B/Beach Music scene, as well as being somewhat of a reply to The Beach Boys’ classic ‘California Girls’). I was expecting to hear one or two of their Beach Music hits. But, they know how to tailor a show, and the selection of songs was outstanding, a great trip through the R&B hits of the group. Still, the group performed brilliant versions of their classic songs: ‘Chairmen of the Board’, ‘Pay to the Piper‘, ‘You’ve Got Me Dangling on a String‘ and ‘Everything’s Tuesday‘ (a great song) followed in quick succession, each delivered superbly by the group and their hybrid backing band. The group even squeezed in a rendition of ‘Reach Out‘ from a Ken Knox & Company recording, a nice song what seemed to reference the Four Tops classic ‘Reach Out, I’ll Be There’. One of the highlights was ‘Patches‘, a song that appeared on the first Chairmen of the Board album, and was co-written by General Johnson. The song wasn’t a hit until the famed blind guitarist Clarence Carter got his hands on it, and turned it into a soul classic despite its frank and depressing lyrics (the song tells the story of how a boy took over running a poor farm in Alabama after the death of his father to provide for his family). Knox sang lead on this one, and did a superb job honouring both Carter and Johnson’s version of the song. He reminisced that when Johnson sang it, people would cry. The Chairmen of the Board closed their set with their biggest hit, ‘Give Me Just A Little More Time’. This Holland-Dozier-Holland track was arguably the group’s finest moment, and it was a pure delight to hear Knox, Stevens and Hunter perform it live. Hunter was given the task of singing the lead, and did a fine job, singing the first verse with just the drums and bass, before launching into a full throated, roaring rendition of their 1969 hit. Overall, this was a classy performance by Chairmen of the Board. Backed by the hybrid band of the Signatures and usual Chairmen of the Board band members, the two factions combined well to create some great arrangements of the group’s hits. No doubt as the tour progresses, the sound will only get better. My final thoughts reflect the fact that there are no original members of the Chairmen of the Board left. We can probably consider Knox to be an equivalent as an original, having performed with General Johnson and Danny Woods for 38 years, and as a “Chairman” for nearly 46 years. He’s dedicated his life to the legacy of the Chairmen of the Board. I found myself thinking about this in relation to other classic soul groups, many of which only have one or two original members left: The Temptations, the Four Tops, The Stylistics, and The Spinners, among others. These groups, unlike The O’Jays or The Whispers, have had periods of flucuating line-ups, as a result of personal and financial disagreements and, more sadly, death. There’ll come a day when the last originals of all these groups will die, begging the question, what happens with the group? Well, one option is that they cease to exist. Another option, as so brilliantly proved by Chairmen of the Board at Under The Bridge, is for long-time members to step up, take the mantle from the originals, and keep the legacy alive as best as possible. It’s a tribute to Ken Knox’s determination and skill that he’s managed to do just that, keeping the legacy of the Chairmen of the Board alive. The tour continues, for more details check out the dedicated Facebook page.